Supporters gathered in the governor’s office for the signing. Iowa has joined 40 other states in passing a law that lets hospital patients designate a family caregiver to receive information about their care once they return home. “Caregivers are unsung heroes who generously give their time to selflessly care for their loves ones,” Governor Kim Reynolds said late this afternoon. 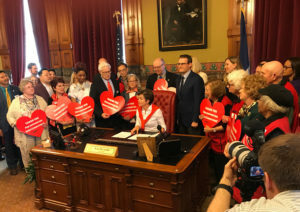 Reynolds was surrounded by dozens of AARP members as she signed the “Iowa Care Act” into law. An estimates 317,000 Iowans are caregivers. The Iowa Care Act calls on hospitals to notify a designated family caregiver when a patient is to be released from the hospital and discuss the patient’s home care needs as well as whether the family caregiver is able to perform all those tasks. AARP State Director Brad Anderson said the bill was five years in the making and the result of accommodations to address concerns raised by hospitals and nurses. 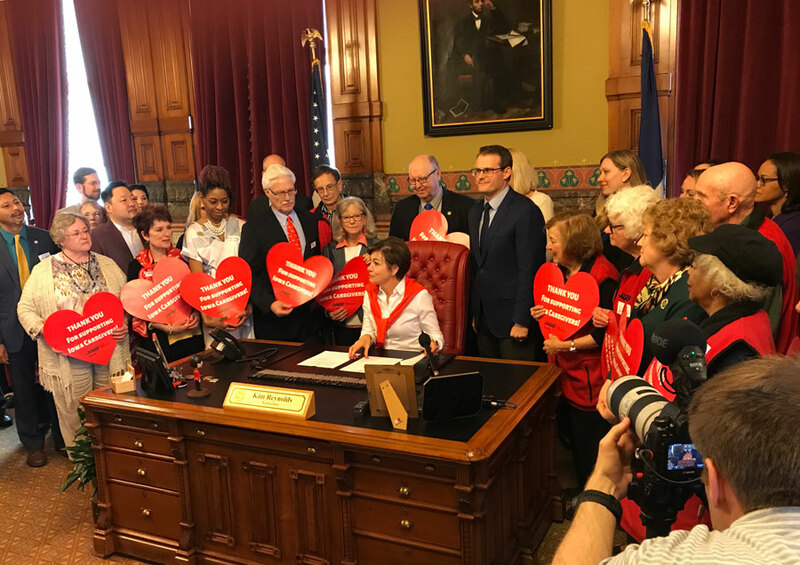 Several AARP members held huge red hearts printed with a “Thank You” message as they stood around the governor’s desk and posed for photos after the bill signing ceremony.